From town, drive out to mile 23.8 and park at the pullout on the right side. 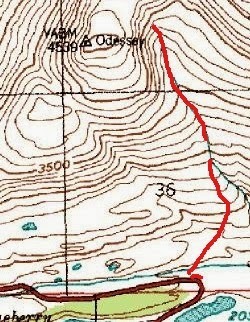 Skin along the road until just before mile marker 24, then angle over to the drainage and start up as shown on the topo and photo below. After following a contour over 3 small benches, you make your way into the Moonlight drainage. You can get to the top of this route with no switchbacks. 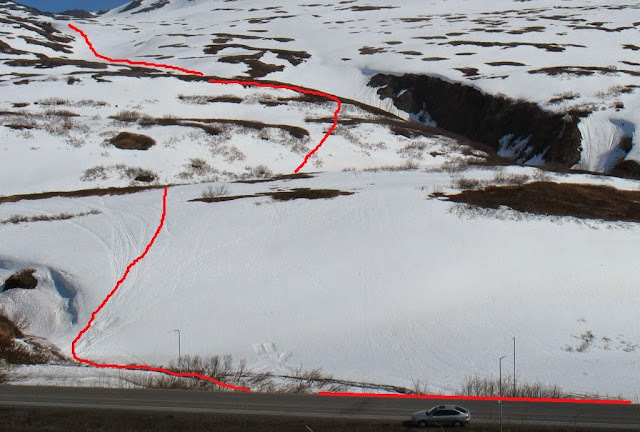 On your way down, stay skier's right of the lower portion of your skin track - the part going through the benches.